Quick. Take a look at your portfolio. Pretend that someone just told you that the stock market was going to close until January 1st, 2023. If you knew that you could not sell any of your current holdings for the next ten years, how many of them would you keep? I was recently reading an old Wall Street Journal article that examined the fact that the fluctuations in net worth among the most affluent 1% of Americans has increased substantially over the past generation. The conventional wisdom on the matter is that we have experienced an unprecedented era of rapid technological innovation, and these changes in technology have threatened the stability of most business sources. That’s part of the story. Another part of the equation is the fact that access to the capital markets are easier today than they have ever been. Let’s explore the implications of this. Let’s pretend it’s the 1950s and we are going to take a snapshot into the life of a young entrepreneur, Cornelius Wellington Hamptingworth III. Deciding to follow in the footsteps of family members that had come before him, our very own Mr. Hamptingworth begins to accumulate a real estate empire. Over the course of fifteen years, our young Cornelius puts together a collection of twenty residential properties capitalized at a 10% rate, chugging out $200,000 in annual rental income. He has a vague idea that if he were to sell all of his holdings, he could get around $2,000,000 in total, pre-tax. But it’s only a vague idea. Since he is not actually putting his real estate for sale on the market, his focus is on the $16,000+ coming into his bank account every month. When hard times hit, his $200,000 in annual rental income might fall to $150,000, but throughout even a terrible recession, he would be aware that he is still generating cold, hard profits deposited into his account. Things are much different today. That is because members of the capitalist class are much more likely to take their holdings public than in previous years. Currently in the United States of America, there are almost 16,000 publicly traded companies on the liquid markets. When you count pseudo-private entities that have “share price trackers” but do not actually trade on a stock exchange, the number becomes much, much higher. 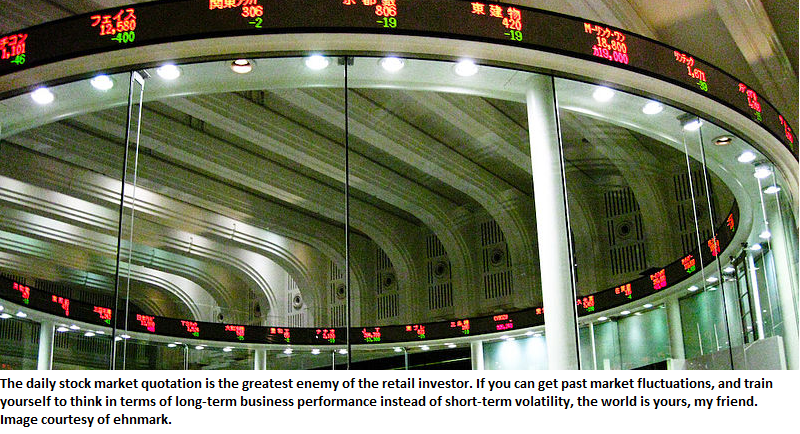 In my opinion, the daily quotation is one of the biggest enemies of the average investor. A modern-day Hamptingworth III would raise capital through the equity markets to establish ownership of his twenty residential properties, by surrendering a small ownership stake of his company to outside investors (it is doubtful that such an operation would trade on a major exchange, but it would be enough for the security to have a “tracker” among certain investors). What are the consequences of this? It introduces a brand new distraction into Cornelius’ decisionmaking process. When the real estate markets collapsed in 2008-2009, Cornelius would have likely focused on the fact that his total net worth declined from $2,000,000 to $1,300,000 and been crushed, even devastated. The fact that he would still be making $150,000 would come as a small consolation considering the fact that he would have “lost” $700,000 in wealth. Maybe he would sell his security. Maybe he would get depressed. Maybe he would take extra risks to try and get his net worth back up to the $2,000,000 mark. The point is that we are not psychologically equipped to handle daily fluctuations, and we need to mentally train ourselves to think in terms of business performance rather than net worth. This obviously has implications with our common stock holdings as well. From 2008 to 2009, Johnson & Johnson actually increased its earnings per share from $4.57 to $4.63. Yet the price of the stock fell from $72.80 to $46.30. From 2008 to 2009, IBM increased their earnings from $8.93 per share to $10.01 per share. Yet the price of the stock fell from $130 to $82. For Wal-Mart, the company increased its earnings from $3.42 per share in 2008 to $3.66 per share in 2009. Yet the price of the stock fell from $63 per share to $46.30 per share. (1) First, you would be very, very particular about the kind of stocks that you allowed into your portfolio. If you knew you had to hold for ten years, you would stick with the bluest of the blue-chips, and you wouldn’t screw around. Your portfolio would have fantastic earnings quality. (2) You would be immune from panic selling. Sure, the share prices of many stocks, including top quality blue chips, fell dramatically from the October 2007 highs to the March 2009 lows. But here is the crazy thing: many of the best companies in the world actually maintained, or even increased, their total profits during this time period. If you did not receive daily quotations of your holdings, you would have had no desire to panic sell! You would have seen that your holdings were achieving record profits, and paying out shareholders record dividends. How can that scare you??? Unfortunately, Buffett’s wish won’t likely come true. We’re stuck in this world where we get stock prices every single day. The next best thing we can do is channel the spirit of Buffett’s comment. We can pretend that we have to make ten-year commitments to our stocks, and as a consequence, end up with a portfolio stuffed with the kind of blue-chip stocks that would make a 1930s widows-and-orphan trust advisor jealous. We can focus on the business performance, and see that even when the prices of our stocks fall by 50%, the business performance of the stocks (if you are dealing with high quality) is very unlikely to fall by 50%, particularly if you are dealing with non-cyclical and non-financial stocks in the large-cap, blue-chip universe. In closing, all I can say is that those two techniques changed my life in a very real way, and I hope you give them some consideration.